Today’s wonder has to be snake handlers. Danger: Non-venomous However bites can cause serious reactions especially in young children. Common in and around Brisbane. Adults feed mainly on birds, including birds in cages. Active at night. Les took the opportunity to do a short talk and first aid basics for the kids at the primary school just next door and gave his card to the Principal if any more snakes be found. I think the kids at the school will all be wearing their shoes and keeping a look out for any thing slippering and slinky today. Les’s advice if I see any more, leave them alone they usually just go away, or maybe squirt with a hose, or gently shoo of with a broom handle, don’t get to close…. 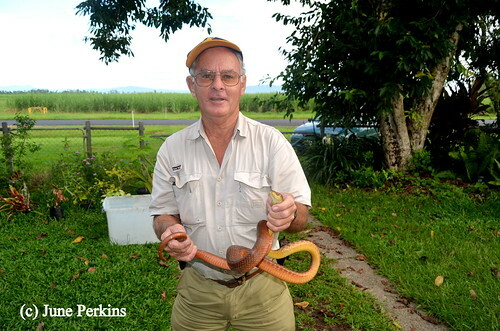 Will leave the rest of this story for a post I think I’ll write for ABC open about our morning with a brown tree snake. Will let you know if it gets posted. It might be timely with so many of them hanging around. I think this post like the snakes will need a bit of care – and I need time to tell the story really well – but honestly if you don’t like snakes and the thought of removing them – snake handlers are a WONDER not to mention a good precaution if you are not sure how to tell if its venomous. Do you have a story about snakes? The kids at the primary school certainly did! (c) June Perkins, all rights reserved.